The New JETECH ITC-G2 Internal Tank Cleaning system is the latest, complete tank/vessel cleaning system designed for horizontal rail and mobile tank systems. 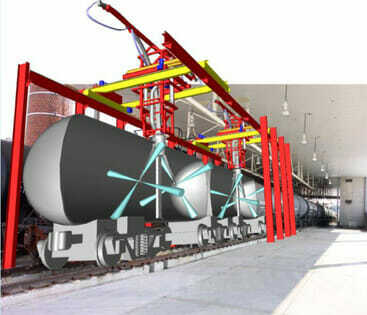 Convenience: ITC-G2 is installed into position over the tank car rail system, supported on an elevated rail platform similar to an industrial bridge crane system. Extreme pressure and flow capacities: High pressure water (or other liquid) up to 20,000 psi (1380 bar) and flow rates to 200 gpm (760 l/m) are used to thoroughly scrub the internal walls and structure of the vessel.